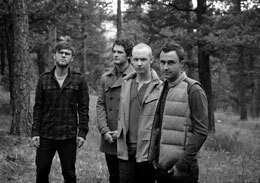 Multiplatinum record-selling band The Fray will perform in the University of Wyoming College of Arts and Sciences auditorium Saturday, Nov. 21, at 8 p.m. Tickets go on sale to UW students Thursday, Oct. 8, and to the public Monday, Oct. 12. Multiplatinum record-selling band The Fray will perform in the University of Wyoming College of Arts and Sciences auditorium Saturday, Nov. 21, at 8 p.m.
Student tickets, limited to two tickets per valid student ID, go on sale Thursday, Oct. 8, for $25. Tickets go on sale to the public Monday, Oct. 12, for $35. Tickets can be purchased at the Wyoming Union information desk, the Fine Arts box office, by phone at (307) 766-6666 or online at www.uwyo.edu/finearts. "We encourage students to purchase tickets before they go on sale to the public," says Michael Lange, coordinator of Student Activities Programs. The Denver-based band achieved national prominence with hit-singles such as "Over My Head (Cable Car)," "How To Save A Life" and "You Found Me." For more information about the concert and other coming events, or to arrange assistance to attend this event, call the Campus Activities Center at (307) 766-6340.